Owner of dozens of land speed records, Ab Jenkins was the famed driver of the Mormon Meteor. He was also the Mayor of Salt Lake City from 1940-1944. Amazingly, he set 21 speed records while in office. The 2011 film, “Boys of Bonneville”, recounts the achievements of Mr. Jenkins. An interesting note about Jenkins’ records is that 15 of them still stand today. Those 15 may stand forever, as some of the trials methods have been abandoned. For example, the 48 hour endurance/speed record which was set by driving around a 10 mile oval on the salt for two days straight. Jenkins’ persona was as a clean-living, deeply religious family man. (By all accounts, his persona and his person were one and the same.) He was known to take a safety razor with him and shave during the final laps of his trial so he would be clean shaven upon arrival at the finish. You can see the film currently on Comcast On Demand, or buy the DVD through Amazon (also available as a watch instantly through Amazon). 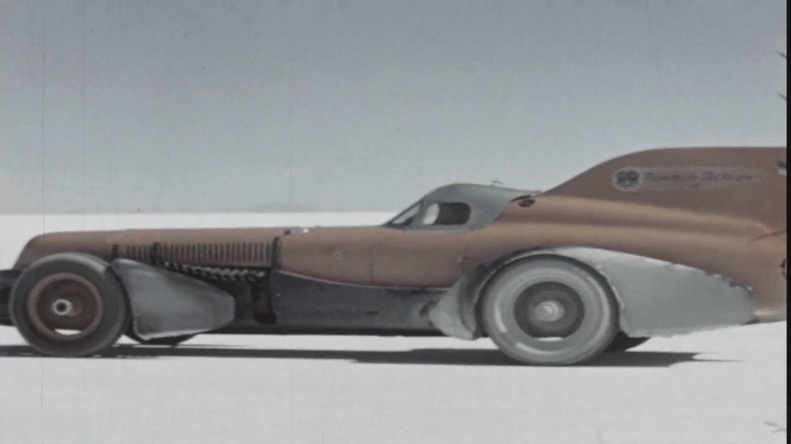 This entry was posted in 1930s, 1940s, 1950s, Custom, Race cars, Sweet videos, Uncategorized. Bookmark the permalink.